Read Together: God told ancient Israel that they were to put out all leavening from their homes, and He also instructed them to eat unleavened bread for seven days. The first and seventh days were to be holy convocations.God’s people continue to observe the Feast of Unleavened Bread by eating unleavened bread for seven days and celebrating the first and seventh days as Holy Days. These days have important meanings in God’s plan for mankind. Passover commemorates Christ’s sacrifice in payment of our sins. The Days of Unleavened Bread picture our effort to put sin out of our lives and replace it with living according to God’s ways. We don’t just avoid doing bad things. We must fill our lives wit good actions, just like our elder brother Jesus Christ. Discuss with your child the biblical meaning of righteousness. Read and discuss Psalm 119:172 together. Remind your child that the Feast of Unleavened Bread is the only one that has two Holy Days and that Passover is a separate feast but it is not a Sabbath. Ask your child to summarize the meaning of the Passover and Days of Unleavened Bread, the first two steps in God’s plan of salvation. 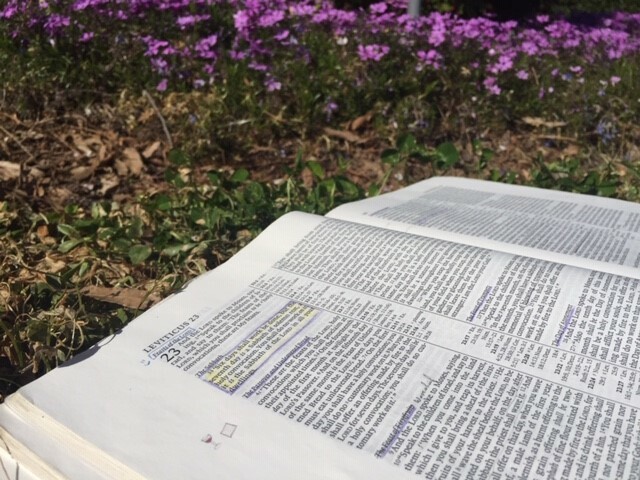 Read Together: God gave ancient Israel instructions concerning Passover observance. On the tenth day in the first month of the year, each family was told to select a special, Passover lamb. This lamb was to be perfect, without any blemishes at all. Four days later, as the 14th day of the first month was just beginning at sunset, they were required to kill the lamb, cook it, and eat it as part of a special Passover meal, putting some of the blood of the lamb on their doorway. Those who did this would be protected from the death angel, who would kill all the firstborn in the land, except those in houses with the blood of the lamb on their doorway. Every year after that, the Israelites were commanded to eat a Passover meal on this same night and remember how God had spared them from the death of the firstborn in their home. But this Passover lamb also symbolized something more. All humans are under the threat of death because we all have sinned, and death is the penalty for sinning against God. We may not have the death angel passing over us, but we still are subject to death for our sins. 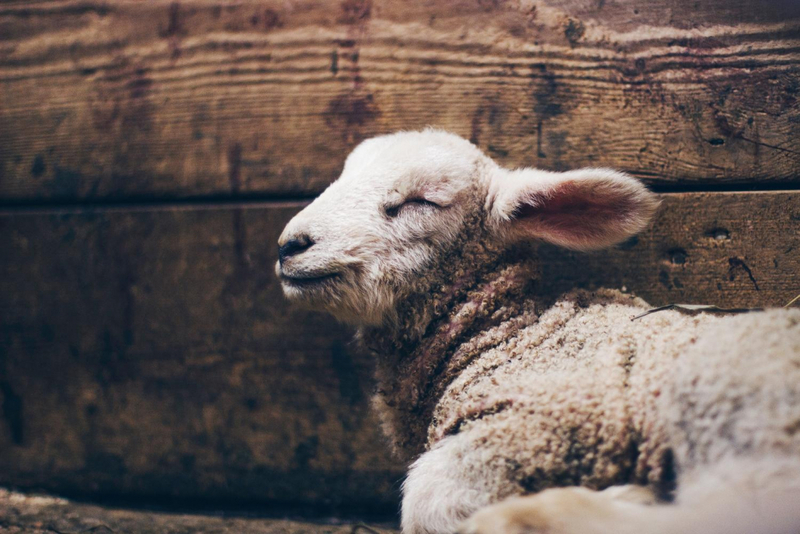 Instead of a Passover lamb, however, we have Jesus Christ. Christ was the perfect sacrifice who was willing to become a human being and then die for our sins, protecting us from death, just as the blood of the lamb on the doorway protected the Israelites. Discuss with your child how awful sin is and why God hates it. Choose one of the Ten Commandments and talk about how breaking it causes misery, pain, and suffering. How different would the world be if that commandment was kept? Remind your student that it is because of sin that Christ had to die. 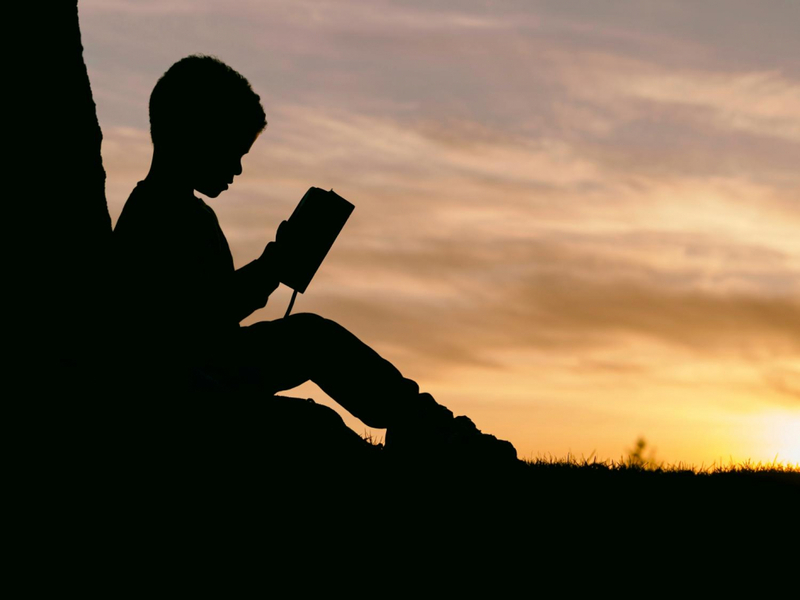 Read Together: Before God created the universe, He planned to create human beings and make them a part of His family. He determined to give mankind the gift of free moral agency. In other words, He would give mankind the ability to make choices. The most important decision is choosing whether to obey God or not. But God recognized that under the influence of Satan, man would choose to follow his own heart and disobey His commands. And just as Satan had done, Adam and Eve rebelled against Him. Since then, all humanity has followed their example. But God is holy and wants nothing to do with sin. So, how could sinful mankind ever become a part of God’s holy family? The answer is amazing! Remember, God had an astonishing plan for the human race to be part of His spirit family, and He wants us to know about it. To help us understand each step in His master plan, He gave us the Holy Days. This is why we observe these days every year, beginning with the Passover. Learning about the Passover helps us to understand the first step in God’s plan for us – and all people who have ever lived. Remind your child that it was God’s plan from the beginning to create a family. We are made in His image (Genesis 1:26–27), and we should grow in character to become like Christ (Ephesians 4:13–15). Discuss with your child what it means to have free moral agency. Mankind has not been given the right to decide what is right and wrong. Only God has the wisdom to make that determination. We choose whether or not we will do what is right as God defines it. Help your child understand that they are a part of God’s plan and that God is looking forward to them being born into His family. https://www.lcgeducation.org/wp-content/uploads/2019/03/Lev-23-flowers.jpg 480 640 Rebekah Ross https://www.lcgeducation.org/wp-content/uploads/2018/07/LE_logo-2.png Rebekah Ross2019-03-29 12:28:352019-03-29 12:28:45Children's Bible Program - Level 2: Lesson 21 "The Holy Days Picture God's Plan"
Read Together: Sarah died in Hebron at the age of 137 years old. God had allowed her to watch her son grow into a man. Shortly after Sarah died, Abraham sent his servant back to his own country to find a wife for Isaac. When the servant arrived at the well outside the city of Nahor, a young woman named Rebekah came to draw water. The servant had prayed asking that the young woman who gave him water to drink and offered to water his camels would be the one chosen to be Isaac’s wife. Rebekah did exactly that. The servant found out that Rebekah was the granddaughter of Abraham’s brother Nahor. Rebekah agreed to leave her family, go to Canaan, and marry a man she had never met. Isaac was forty years old when he and Rebekah were married. Abraham died at 175 years of age and lived to see the birth of Isaac’s sons. This was further evidence that God’s promise of giving Abraham many descendants would be fulfilled. After Abraham died, God spoke to Isaac and made the same promises to him that He had made to Abraham. 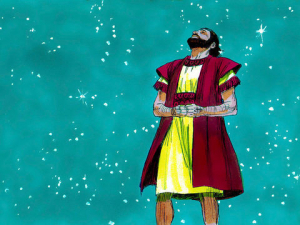 God said that He would give all the land of Canaan to Isaac’s descendants, and that they would be as numerous as the stars in heaven. God promised that in Isaac’s seed, all the nations would be blessed. 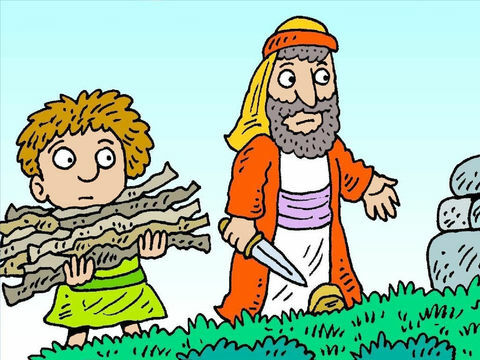 Point out to your child that Abraham had seven other sons who are named in the Scriptures – Ishmael (from Hagar), and Zimran, Jokshan, Medan, Midian, Ishbak, and Shuah (from Keturah). However, Isaac was the son of promise. Discuss with your son or daughter the qualities the servant was looking for in a wife for Isaac by seeing if she would give him water and offer to water his camels. Talk to your child about the blessing Rebekah’s family gave her. How does her blessing relate to the promises God gave to Abraham and his descendants? Ask your child how they think Isaac may have felt when God appeared to him personally. Would that be very encouraging for Isaac? https://www.lcgeducation.org/wp-content/uploads/2019/03/019-rg-abraham-isaac.jpg 360 480 Rebekah Ross https://www.lcgeducation.org/wp-content/uploads/2018/07/LE_logo-2.png Rebekah Ross2019-03-21 17:38:272019-03-21 17:38:32Children's Bible Program - Level 2: Lesson 20 "Isaac Inherits the Promises"
Read Together: Abraham and Sarah watched and guided Isaac as he grew into a young man. Abraham taught Isaac about God and told him about the promises He had made. Then, when Isaac was still a young man, God told Abraham to take him to the land of Moriah and offer him as a sacrifice! After hearing God’s instruction, Abraham dutifully arose the next morning, prepared for the journey, and headed toward the mountain with Isaac and two of his servants. It took them three days to reach the place where Isaac was to be offered. One can only imagine how difficult this journey was for Abraham. Nevertheless, He was willing to obey God’s command. Remember, God had promised that He would give many descendants to Abraham, and Isaac was the son who was miraculously born to Abraham and Sarah to bring about that promise. He knew that God was able to raise Isaac from the dead, if necessary, to keep His promise. Abraham and Isaac went up to the top of the mountain where Isaac allowed himself to be bound. Then Abraham laid his son on the wood of the altar to become the offering. Abraham raised the knife to slay his son when God stopped him. God then knew without any doubt that Abraham feared Him, trusted Him and loved Him more than anything or anyone – even his own son. God blessed Abraham for his faith and obedience and gave him even greater promises than before! God told him that all the people on earth would be blessed because of Abraham’s obedience! Point out some great examples in the Bible of young people seeking God’s will and obeying Him. Isaac is one of them. Who else can you remember? Discuss with your child some examples in Abraham’s life that validate why he is called the father of the faithful (Romans 4:16). Help your child think about how difficult it would be to sacrifice your child or to be the person who is sacrificed. Ask them to imagine what it would have been like to be Isaac. Isaac could have run away, but instead he followed his father’s instruction, just as Abraham was following God’s instruction. This would have taken great courage and faith on the part of Isaac toward his father! Explain to your child how Abraham and Isaac pictured the Father and Jesus Christ during their test. Abraham was a type of the Father who offered His Son, and Isaac pictured Christ, who willingly laid down His life (John 10:17–18). https://www.lcgeducation.org/wp-content/uploads/2019/03/005-ls-abraham-isaac.jpg 360 480 Rebekah Ross https://www.lcgeducation.org/wp-content/uploads/2018/07/LE_logo-2.png Rebekah Ross2019-03-15 10:32:292019-03-15 10:33:22Children's Bible Program - Level 2: Lesson 19 "Abraham and Isaac Are Tested"
Read Together: God promised to make Abram a great nation, saying that all the nations of the earth would be blessed through him. God showed Abram all the land of Canaan and promised it to his descendants. Abram had traveled throughout the land of Canaan for 24 years, and now he was 99 years old. God had promised that his descendants would be as numerous as the sand on the seashore, but he still did not have a son. It was at this time that God appeared to Abram and expanded the promises. He told Abram that he was going to make him a father of many nations and that some of his descendants would be kings. God changed Abram’s name to Abraham and his wife’s name, Sarai, to Sarah, to reflect the promise that many nations would come from them. God told Abraham that he and Sarah would have a son the next year, and they were to call him Isaac, which means laughter. Perhaps Isaac was given that name because both Abraham and Sarah laughed when they first heard they would have a son. The next year Isaac was born, just as God had said. Isaac was the beginning of the fulfillment of God’s promises to Abraham. 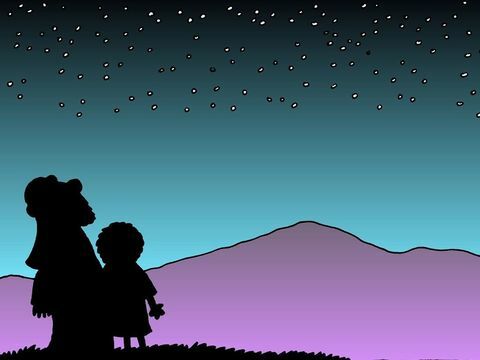 Discuss with your child how Abraham remained faithful to God year after year, believing that God’s promises would be fulfilled through his descendants. Include Hebrews 11:1 in the discussion. Remind your son or daughter that if God says something, it is as good as done! Ask your child if they can remember some of the promises God gave to Abraham. Discuss with them how these promises have been fulfilled (e.g. through Jesus Christ, European kingdoms, Great Britain, and the United States). Remind your child that the promises were also made to Sarah. She was an important part of the covenant God made with Abraham. God loves both men and women. All human beings are created in His image (Genesis 1:27). God names things what they are. From the Bible, we learn that in the Kingdom we will all to be given a new name. Ask your child what name he or she would choose for themselves to reflect their character and personality. https://www.lcgeducation.org/wp-content/uploads/2019/03/003-abraham-promise.jpg 360 480 Rebekah Ross https://www.lcgeducation.org/wp-content/uploads/2018/07/LE_logo-2.png Rebekah Ross2019-03-07 17:55:522019-03-08 13:30:24Children's Bible Program - Level 2: Lesson 18 "God's Promises to Abraham"
Read Together: Abram was born 292 years after the flood. His family lived in a city called “Ur”, which was in the area of modern-day Iraq. He was the youngest son of his father Terah whose ancestor was Shem. Abram married his half-sister Sarai, but they did not have any children. Terah left Ur for Canaan and took Abram, Sarai, and Lot, his grandson, with him. The family stopped for a while in Haran where Terah died. Abram had become very wealthy in Haran. By the time he was 75 years old, he owned livestock, and had silver, gold, and many servants. This would surely have made it hard to leave Haran. But God commanded Abram to leave his home and go to a distant land that He would show him. 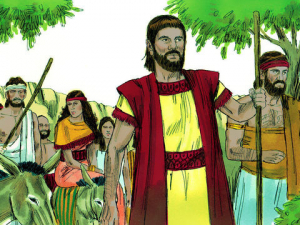 In return for his obedience, God promised to make Abram’s descendants a great nation. Amazingly, Abram immediately obeyed God. He simply took his wife, his nephew Lot, and all their possessions and left his home for good. Explain to your child that it was not uncommon for people to marry close relatives in Abraham’s days. Remind him/her that everyone was closely related after the flood because only one family survived. God later commanded the Israelites not to marry close relatives (Lev. 18:6-17). Discuss with your son or daughter how difficult it must have been for Abram and Sarai to pack up and move to a place that they did not know. There were no trucks or vans to move them and no hotels along the way. Ask your student what might have been some of the hardships Abram and Sarai could anticipate on their journey. Abram must have known how hard his journey would be. Still, he did not argue with God. He just obeyed what God told him to do. 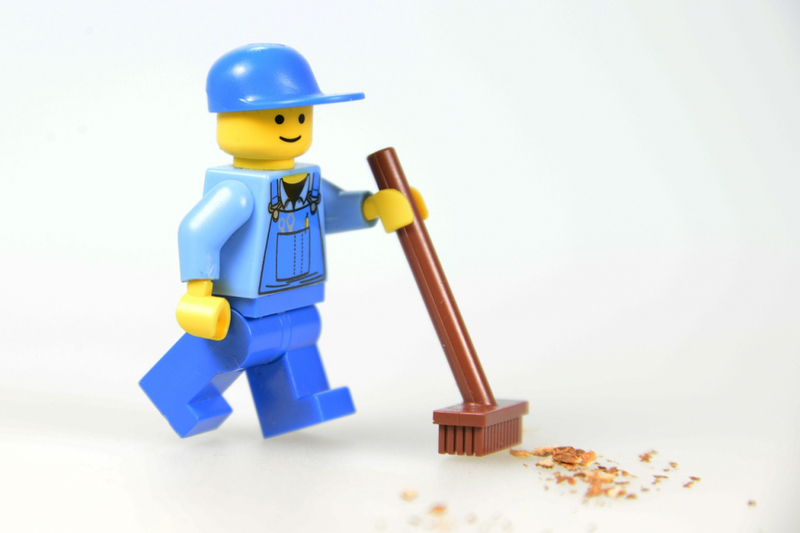 Talk with your child about Abram’s character. Highlight the good example that Abram showed when he obeyed God immediately. God promised Abram that he would become a great nation, but that promise was not fulfilled right away. Explain to your student that obedience to God must come first before we receive any rewards. https://www.lcgeducation.org/wp-content/uploads/2019/02/006-abraham-canaan.jpg 360 480 Rebekah Ross https://www.lcgeducation.org/wp-content/uploads/2018/07/LE_logo-2.png Rebekah Ross2019-02-28 16:50:442019-02-28 17:21:11Children's Bible Program - Level 2: Lesson 17 "Abram Leaves for Canaan"
Read Together: The Bible portrays Nimrod as an evil man, and we still see the effect of his evil influence today. Nimrod is the first recorded leader to organize people into city-states so that he could rule over them. He was a proud tyrant who was openly rebellious toward God. 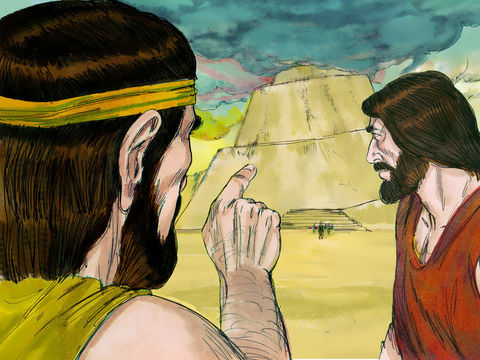 Nimrod built the city of Babel, and led the effort to undermine God’s plan for people to spread throughout the earth, building a tower that reached to the sky. Many historians trace the pagan traditions that are part of all of the world’s religions today back to this very city. People who are really following God avoid these traditions, even if they are mixed with a worship of Christ. Instead, God’s people keep His Sabbath, Holy Days and other commands. Read Together: Genesis 10:8–12; 11:5–9; Revelation 17:5; 18:1–2. Ask your child what are some wrong traditions that people in the world’s churches observe? Explain that many modern church traditions of the world started a long time ago. (You may wish to refer to the booklet, “Satan’s Counterfeit Christianity,” pp. 8–10, https://www.tomorrowsworld.org/booklets/satans-counterfeit-christianity). Explain to your child that we can only understand God’s truth because He opens our mind and helps us not be deceived (John 6:44, Matthew 13:11). Ask your child what about God’s way of life are they most thankful for? Read Together: The city of Babel was the beginning of Nimrod’s empire, and the beginning of mankind’s post-Flood attempt to govern himself apart from God. Nimrod led the people to build a very tall tower in rebellion against Him. But God was not pleased with their actions, so God decided to confuse the people’s language. They couldn’t share ideas and so they weren’t able to keep working on the tower. The word “Babel” itself means confusion, and you can imagine what happened when God confused the languages. Only those who spoke the same language could understand each other, and God divided the languages along family lines. People stayed with those they could understand, and they began to settle in their own territories as God wanted them to. Needless to say, work on the tower ceased. The Tower of Babel was never completed, but the attitude of mankind’s rebellion against God continues to this day. 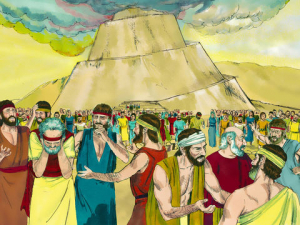 Ask what the people of Babel did to show their defiance toward God. Ask your child to imagine working on a group assignment when suddenly he or she could not understand anything other members of the team were saying. Would they be able to work together as a team? This is the same situation that occurred in Babel when God confused the languages. Point out to your child that God wants people to communicate and understand one another. This is why He will restore a pure language to mankind in the Millennium (Zephaniah 3:9). 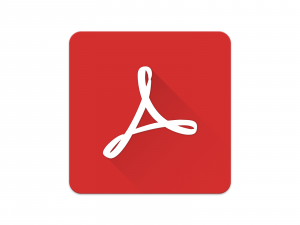 https://www.lcgeducation.org/wp-content/uploads/2019/02/004-tower-babel.jpg 360 480 Rebekah Ross https://www.lcgeducation.org/wp-content/uploads/2018/07/LE_logo-2.png Rebekah Ross2019-02-15 13:26:012019-02-20 15:42:13Children's Bible Program - Level 2: Lesson 15 "The Tower of Babel"